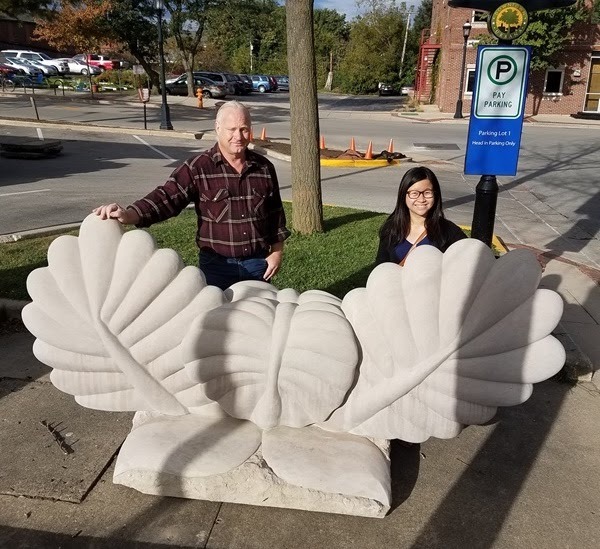 Downtown Urbana Turning Over "A New Leaf"
The Public Art League is proud to welcome "A New Leaf" by Don Lawler (Stephensport, KY). "A New Leaf" is a functional sculpture that represents self-renewal. The composition is intended to look like a victory laurel - or bird wings taking flight. The piece is carved from Indiana limestone and weighs close to 3,000 pounds. "A New Leaf" is installed near the corner of Race and Water Streets in downtown Urbana. A big thank you to the City of Urbana and the Urbana Public Arts Program for the sponsorship and installation of the piece! The Public Art League welcomes "Horse and The Hound" by Jim Collins (Signal Mountain, TN) to a serene spot by the Boneyard Creek in Urbana. Come visit the piece in the park near the Boneyard Creek at the corner of N. Race and Griggs Streets. 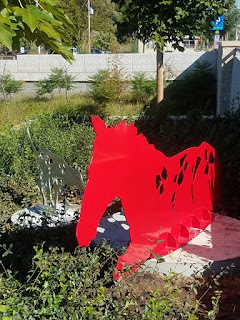 The horse and hound are life-sized and made of powder-coated stainless steel. Thank you to MCDJ, LLC for the site sponsorship of the piece. Also, thank you to the City of Urbana and the Urbana Public Arts Program for their support with site preparation and installation. 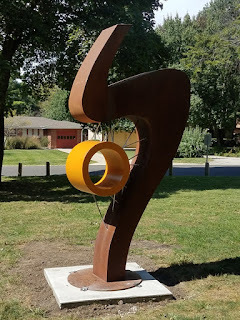 "Hole in My Heart" Installed at Hessel Park! Join the Public Art League in welcoming "Hole In My Heart" by Benjamin Pierce (Cape Girardeau, MO) to Hessel Park in Champaign. The sculpture was constructed from welded and stainless steel with portions painted with hi-solids poly paint. It stands 9 1/2 feet tall with its shape matching the contours of the beautiful Hessel Park trail. A big thanks to Barham Benefit Group for sponsoring the site. Thanks also go out to the Champaign Park District for their work with site preparation and installation.